Two months ago, Steven and I bought a house. We’d been looking for for something old, with lots of character, in the country(ish). We bought an early ’70s midcentury-inspired, contemporary-as-all-heck house in the suburbs. And we love it. What I love perhaps most of all is having a beautiful backyard where I can garden and my pups can hang out. My wonderful parents came down to help us move, and my dad built us two raised garden beds. He also brought plants galore and taught me all about the best ways to transplant various little plantlings. (It pays to have a master gardener who spends most of his free time at a greenhouse for a dad!) We planted relatively late in the season and had a little deer-eating-all-the-baby-tomatoes incident, but things are finally starting to pick up out there. I have more basil than I know what to do with, and everything is coming in beautifully. I love it. Just look at these sweet filius blue peppers — aren’t they cute?! Cutest lil peppers that you ever did see. I also love living a mile from a wonderful weekend farmers’ market. On Saturday mornings, I walk over to the market to stock up on lush fresh veg and fruit, then treat myself to a cold-brew coffee from Brewing Good Coffee Co., a local craft coffee roaster that just happens to be run by vegans. (Their motto is “Drink coffee. Save animals.” Done.) By the time I get home, I’m extra sweaty from being weighed down by all that veggie goodness, but at least I’m caffeinated! Melt the coconut oil in a large saucepan over medium-low heat, then add the ginger, garlic, and pepper/pepper flakes. Cook for about 3 minutes, or until the garlic starts to brown, then add the tofu. Cook the tofu over medium-low for 7-10 minutes, turning every few minutes, until the cubes start to get crispy and golden. 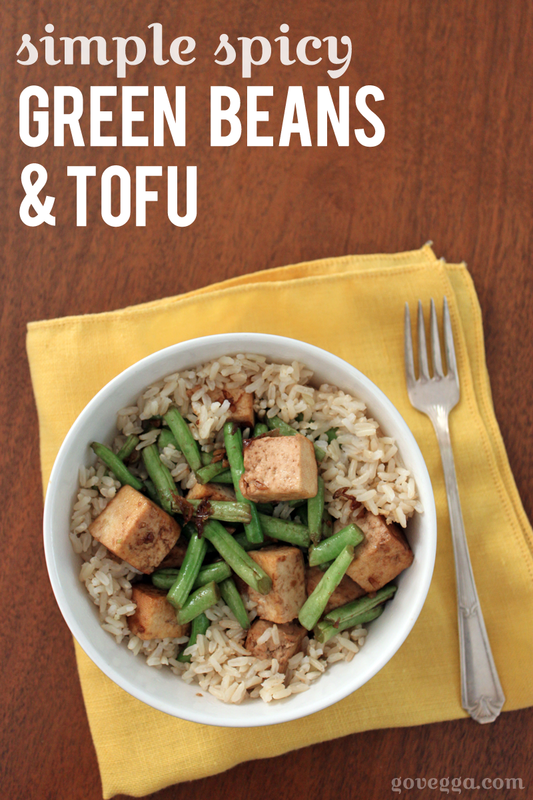 Keep the heat on medium-low so the tofu doesn’t burn. Add the green beans to the saucepan and cover. Cook for another 3-4 minutes. Remove the lid and pour in the sauce. Stir to coat, and cook for another minute or two until the sauce is absorbed. Serve immediately over brown rice. *You can really use any fresh hot pepper you’d like — I just happened to have two of these little guys ripe and ready to go. What’s your favorite easy summer veg-forward dinner? Note: This post contains an affiliate link. If you purchase something through my link, it costs nothing extra for you, but I get a few pennies. Happy to help and looking forward to recipes using the food you grow. Your new home and garden sound heavenly! I can’t imagine having both the space and sunlight to grow my own green beans. That certainly won’t stop me from trying your recipe though. That sounds too good to pass up!